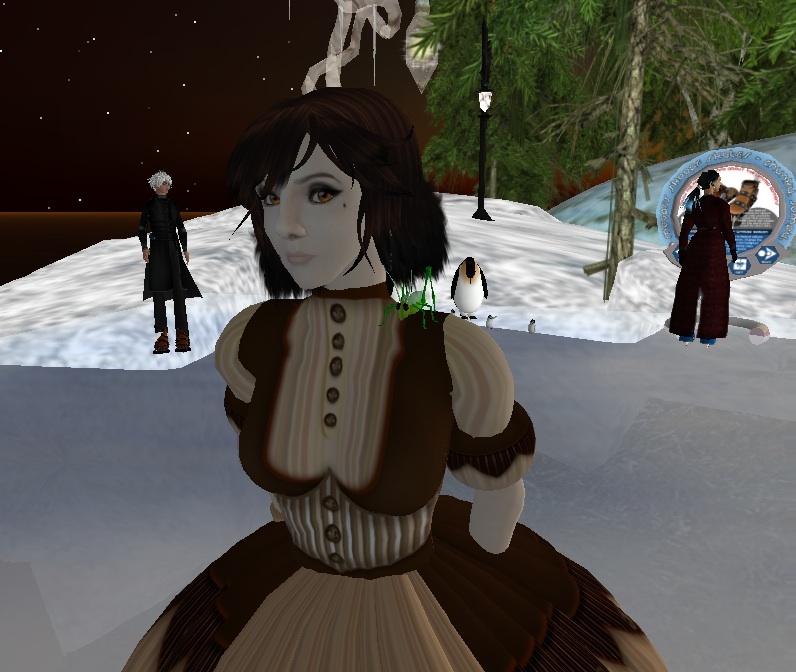 Tonight, hyasynth Tiramisu hosted a skating party on the frozen-over lake at silent sparrow. She DJed (and drank :D ) while a crowd of her friends skated about on our Skoopfs. I tend to photograph myself a lot because I go on lonely jaunts around the world, but tonight there was a lot of nice people-watching. Cornelia Rothschild, the mechanical dollie. She has a wind-up device that keeps her going. All tuckered out from skating in bits of hy's Delerium. hyasynth gave us some extremely cute freebies at the party. This is a holly-colored take on the Mille Feuille jacket and shirt, along with a green and black scarf. Yeah yeah I should probably tell you the rest of what I'm wearing, but I think the photos are fun all by themselves. I was expected to see myself...with my skirts above my ears. *smiles* I had a lovely time and am very pleased you could espace the meat space a bit to attend.